Cabbage Patch Kids burst on to the scene in 1983, and whilst not at the height of popularity they were then are still available today. They were the brainchild of American artist Xavier Roberts, who initially created hand stitched dolls that he sold at craft fairs. 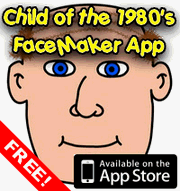 They were discovered by US toy firm Coleco and soon became a must have Christmas gift. In fact, Cabbage Patch Kids were probably one of the first toys to kick-start todays pester power tactics, where parents feel they have to buy their little cherubs whatever they desire for Christmas, no matter what. 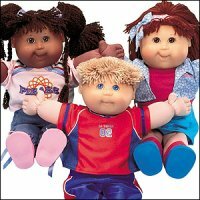 The big selling point of Cabbage Patch Kids was that they were all unique. No two dolls were supposed to be alike, and to be fair this generally seemed to be the case, as you never saw two completely identical dolls in any shop. They would differ not just in the clothes in which they were dressed, but also in hair colour and style, eye colour, mouth shape, skin tone etc. Each also came with a certificate of adoption from Babyland General Hospital, which told you the dolls name. You had to fill this in with your details and send it back to “legally” adopt the doll – which also gave you the option of choosing your own name for the doll if you disliked its given one. The head was made out of a stiff plastic with wool for hair stitched on in various styles, including unruly mops, pig tails, pony tails and the like. Where they differed most from the usual doll of the time was in their soft stitched bodies. Whilst permanently stuck in a “give me a hug” pose, the arms were stitched to give the impression of fingers and thumb, wrist and elbow, whilst the legs had toes and knee dimples. When stripped of its clothes you also discovered it had a navel made from a cloth covered button, and it even had stitching to create a chubby little bottom! One bottom cheek also had Xavier Roberts signature scrawled upon it, with the colour of the ink changing from year to year – black being the colour originally used. The reference to cabbage patches was not because the dolls faces had a certain cabbage like quality about them, but because the back story to them was that they were born from giant cabbages, then collected by stork and ferried to the Babyland General Hospital. This story is brought to life by the real life hospital that Xavier opened in Georgia. He converted an old clinic into a tourist attraction where you can go and see new Cabbage Patch Kids being born. To be quite honest, they were a little ugly in the face department, although I guess this had the effect of making kids want to care for them all the more. In fact, their unorthodox looks even spawned some conspiracy theories, the wildest being that they were given their looks under order of President Reagan in order to prepare people for what people might look like due to the effects of radiation after a nuclear war! Another myth perpetuated that if you sent your doll back to the manufacturer for repair, you would instead receive back a death certificate. This entry is filed under Toys - Dolls and Action Figures	and was posted on October 25th, 2007. You can follow any responses to this entry through the RSS 2.0 feed. You can leave a response, or trackback from your own site. I wanted one from Santa, but my mother said no as they were too ugly! Looking back, she was probably right.